It is often seen that people who worship gods at temple rung bells when they enter the temple. These bells are hung generally near the idols or at the entrance of the temples. They are also rung while the devotees are performing Aarti. So whats the reason behind ringing those bells? There is an art and science of making bells to produce the requisite sounds. There are bells specially made to produce the long strains of the sound OM. The handle of a ghantadi signifies prãna – the vital force in the form of Hanumanji, Garud, Nandi or Chakra. During Garud sthãpanvidhi, the handle is offered pujan. A bell without a handle in one of these forms is forbidden in rituals, since it may augur misfortune. The body of the bell is said to represent the divinity of time (Ãgama-Kosha 1992 VI:99). (Source:kids.baps.org). Here is a deep scientific analysis of the temple bells. Bells are also used to inform people to gather for aarti too. For the same reason we chant hymns, sing Aartis etc. They are associated with music. In Hinduism, music is considered a way of worship... In-fact, so much so, it is associated completely with worship. A bell is just another musical instrument. It is used for worship because of this reason. It also creates sounds which create a mythical environment. It can be experienced with day to day life. Go to a temple, hammer a bell, and you will feel more close to the temple, and in a more soothing, sacred world! They create positive vibrations as well. The Bell which you see here are seen in Siva temples, not in other temples. Thus bells are sounded in Siva temple while entering to awaken rather draw the kid attention of the benevolent God who remains in deep meditation all through. Besides small bells are sounded at the time of offerings of consecrated foods (also incense and lamp) for(a) not to disturb the deity by external noise and (b) for his pleasure. Further a special type of bell is sounded when the deities move in journeys outside the sanctum or the waving of lamps are ceremonially performed. In some prominent temples local resident used to take heir meals only after their revered god is offered with foods. Here cymbals are sounded near the gates of the temples to make others know that now the god is enjoying his food and hence they can either go for food cooked in their houses or can collect Prasad from the temple. Not the answer you're looking for? Browse other questions tagged belief temple . 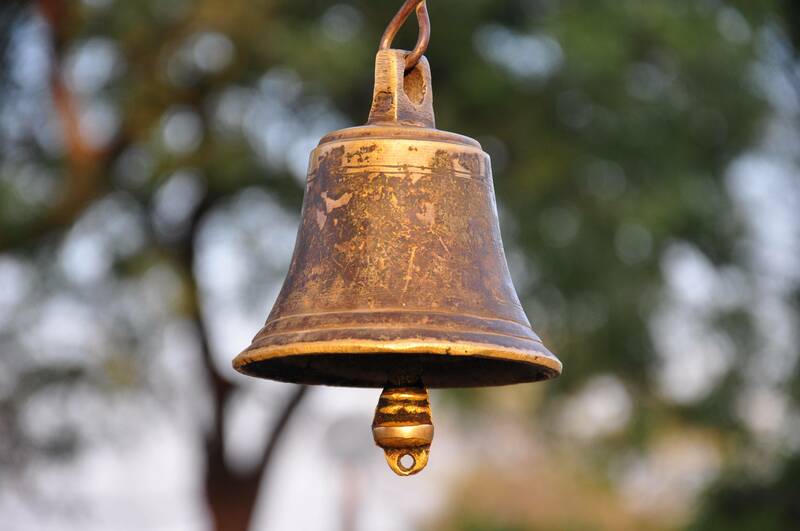 What is the significance of bell in Hindiusm?